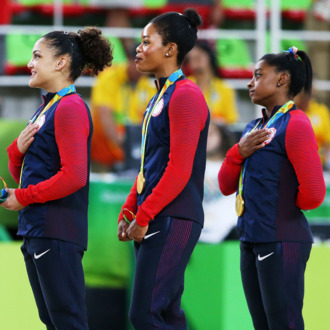 Was Gabby Douglas’s National Anthem Stance a Silent Black Lives Matter Protest? There might have been a deeper meaning to Gabby’s gesture. While the members of the U.S. women’s gymnastics team were busy being Olympic gods in the team competition on Tuesday, Twitter trolls were hard at work finding another reason to shame Gabby Douglas. If it’s not her hair, it’s her choice of salute to her country (or, in this case, lack thereof). During the medal ceremony yesterday, many were quick to point out that Douglas was the only member of the “Final Five” not to put her hand over her heart while the U.S. national anthem played, as is thought to be tradition. Many critics perceived her stance — she instead hung her hands in fists in front of her — as a refusal to pledge allegiance to the American flag and, thus, America. But as others have noted, the national anthem and Pledge of Allegiance are not the same, and there’s no Olympic or constitutional requirement to hold one’s hand over their heart or sing during it. Still, trolls will troll. And rather than get to enjoy her second team gold medal in peace, Douglas had to diffuse the situation on Twitter, writing in a note that she meant no “disrespect” and was simply “standing at attention” like every other medalist. Black Twitter, on the other hand, has a more symbolic interpretation of Gabby’s gesture. Because Tuesday’s competition also fell on the two-year anniversary of Michael Brown’s death, some have speculated that Gabby’s solemn pose was more a show of respect for the victims of police brutality than patriotism — allegiance to the Black Lives Matter movement, in a sense. #Salute to Gabby Douglas for not putting her Hand Over her Heart During National Anthem. Her note says nothing to suggest that was her intention — and it’s unlikely she would confirm a silent protest with the games still in progress — but if Gabby were acting in solidarity with BLM, she’d be far from the first Olympian to send a pro-black message on the world stage. Recall the 1968 Summer Olympics, when black runners Tommie Smith and John Carlos raised the black power salute on the podium in what has become an iconic civil-rights image. Whatever Gabby’s purpose for not placing her hand on her heart, the vitriol she’s received for it has been markedly different from the reaction to other similar apparent signs of disrespect.